Indoor air quality (IAQ) can be worse than outdoor (or ambient) air quality (AAQ) due to the many sources of pollution within buildings and homes. Clean Air in London (CAL) is therefore campaigning to build public understanding of indoor air quality, initially in London, with support from Camfil Farr. 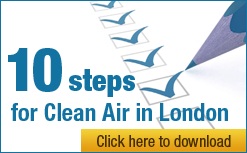 This report examines the issue of air filtration in public buildings in London. It includes the results of an Environment Information Regulations request to local, regional and central Government bodies asking ‘which buildings owned, occupied or managed by the Local Authority use regularly maintained air filters that comply fully with European guideline EN 13779 e.g. offices and schools’. The responses received have been analysed and ranked. The Greater London Authority Group (GLA Group) has detailed knowledge of its buildings. For example, Transport for London (TfL) confirmed that seven buildings in its ‘Head Office Portfolio’ were due to comply fully with EN 13779 by April 2012 with eight others in 2012/2013. CAL has been surprised to discover a big difference among the 33 local authorities in London in terms of how much they know about indoor air quality standards in their buildings. Some have been able to provide quite detailed information on compliant buildings whilst others seem to have little idea of which buildings comply with EN 13779. Many local authorities have told CAL they do not know about compliance with EN 13779 in some or all of their schools because they are independently managed. CAL is therefore encouraging the London Assembly to investigate IAQ with a particular focus on health and energy savings. The investigation should consider buildings with existing mechanical ventilation and others where standalone or ducted air filtration may be needed. There is a tremendous opportunity to improve public health and save energy Note 1 and money through the use of regularly maintained air filters that comply fully with EN 13779. Outdoor air quality is very poor in much of London. CAL believes that the solution to this problem is action to reduce emissions of air pollutants at their source. However, in the short term, managers of buildings in polluted areas should take steps to protect the health of those who visit or work in these buildings. Such buildings may include private offices and other workplaces as well as public buildings used by the general public and public sector employees. A report by the EnVIE project estimated that European citizens spend on average over 90% of their time indoors. Children and the elderly are especially vulnerable to the impacts of poor air quality. Figures obtained by CAL show that 2,270 schools in London are within 400m of roads carrying over 10,000 vehicles a day i.e. busy, polluted roads. Schools located in polluted environments should be equipped with effective air filtration in order to maintain a healthy environment for children. Many buildings are now equipped with some form of mechanical air treatment system. This may be mechanical ventilation, air conditioning (heating/cooling) and/or air filtration or any combination of these (or none of them). A system may service an entire building, or just part of it. Where air filtration systems are installed a wide variety of filter materials can often be used. Higher quality, low energy air filters, such as those made from glass fibre, designed with a large surface area to reduce pressure drop (so-called ‘bag filters’), can achieve and sustain much higher particle efficiencies at lower total lifetime cost (as energy may use up to 70% of total cost). Ultraviolet light may eliminate some pathogens but do little or nothing to eliminate particles or gases. Cheaper synthetic filter materials may depend on electrostatic charge to comply with standards initially but can lose their charge and require much more frequent replacement with all the associated maintenance and disposal costs. The efficiency of carbon filters depends on charcoal’s ability to retain gas molecules on its surface which in turn depends on the quality and surface area of charcoal and the type of gas, contact time and gas concentration. If a building is located in an area with high levels of air pollution, filtration can also be used to remove pollutants to protect the health of occupants. In these types of environment it is desirable to have a ‘sealed’ building with non-opening windows, using mechanical ventilation providing clean, filtered air to occupants. Standalone air filters can also be very effective at improving IAQ. The type of filters used in a system will depend upon the level of filtration required. For dust and particles two filters are typically used: a coarse (lower cost) filter followed by a finer, more expensive filter to remove smaller particles. If filtration of pollutant gases is required a second gas or ‘molecular’ filter will also be used. In all cases filters need to be regularly maintained in order to perform effectively. recommending the level of filtration required, based upon the ‘input’ air and desired quality of the ‘output’ air in the building. Buildings located in an unpolluted rural area only require a single stage particle filter to maintain medium or high indoor air quality. However, for buildings located in a polluted city centre, two stage particle filtration and a gas filter will be needed to achieve the same result. More information about EN 13779 can be found at www.camfilfarr.co.uk/Filter-technology/Specifications-and-Regulations/EN-13779. CAL submitted requests under Environmental Information Regulations (similar to Freedom of Information Requests) asking public bodies in London ‘which buildings owned, occupied or managed by the Local Authority use regularly maintained air filters that comply fully with European guideline EN 13779 e.g. offices and schools’. The request was sent to central government, the GLA Group and all of the London Boroughs. CAL received a response from all those contacted. It is important to note the limitations of this research. The responses received varied significantly, from complete lists of buildings complying with EN 13779 to short notes stating that all relevant buildings complied. Only a small number of local authorities were able to provide information on schools, with the remainder suggesting CAL approach schools individually for this information. Finally, CAL does not know how many public buildings do not have filtered air, making it difficult to assess how seriously public bodies are taking this issue. CAL received a response from the Cabinet Office (central government) stating that ‘Each Government department is accountable for the property they own or occupy, and as such will be responsible for its maintenance and compliance with any legislation’. City Hall ‘regularly changes air filters that comply with European Guideline: EN 13779’. Seven buildings in Transport for London’s ‘Head Office Portfolio’ were due to comply fully with EN 13779 by April 2012 with eight others in 2012/2013. Of the remainder, three require significant upgrade to be compliant, four are landlord controlled and maintained and 17 are naturally ventilated or have no central ventilation. TfL considers its timescales are reasonable as, even with straightforward filter swaps, this would be done at the end of a filter’s useful life, rather than early disposal/replacement which may have an increased environmental impact. It may also require additional maintenance visits (at extra cost) rather than coinciding with planned visits. TfL says it has a good level of compliance, given a diverse building stock dating from as far back as the late nineteenth century, with a recent piece of legislation that is not retrospective. TfL asked that its compliance rate and the challenges (and in some cases lack of feasibility) of compliance be recognised. Finally, TfL chose to include information on landlord buildings in its response to be consistent with its other published data on building numbers. TfL said that, as partial occupiers and tenants of buildings, it did not wish to impose on building owners a requirement to make changes to buildings that it considers may not be implementable. The third group provided a positive response, but did not include details of schools. Most of this group stated that their school buildings were independently managed Note 4, and CAL would have to approach the schools individually for this information. CAL’s survey reveals that building management varies significantly between public bodies. Centralised bodies such as the GLA Group were able to provide detailed information on compliance with EN 13779 across their property portfolios whilst other bodies were either unwilling or unable to provide this information, presumably due to a lack of central information on their properties. This situation is particularly acute with regard to schools. Most local authorities told CAL that their school buildings are independently managed e.g. by the schools themselves. Whilst CAL understands the logic of devolving building management to schools there is a question mark over whether individual schools are receiving appropriate advice on compliance with EN 13779 and the need for air filtration (if they are located in areas of poor air quality). For local authorities that provided information on schools compliant with EN 13779 it is possible to calculate the proportion of their schools that comply. For example Newham’s website states that there are 100 state schools in the borough – 36 have EN 13779 compliant air filtration i.e. 36% of schools. However these figures may tell us more about the age of school buildings than whether the local authority is addressing poor indoor air quality, with new school buildings far more likely to be mechanically ventilated (hopefully with air filtration) than older buildings. CAL believes that all public buildings in areas of poor air quality need adequate air filtration in order to provide a healthy environment for their occupants. However, an initial focus should be on buildings where occupants are especially vulnerable to the impacts of air pollution, such as schools. It is evident from CAL’s enquiries that most local authorities do not know if their schools have adequate air filtration, and more research is needed to ascertain which schools are located in areas of poor air quality in addition to guidance for school managers on providing clean, healthy air in their buildings. CAL is therefore encouraging the London Assembly to investigate IAQ with a particular focus on health and energy savings. The investigation should consider buildings with existing mechanical ventilation and others where standalone or ducted air filtration may be needed. CAL also urges local, regional and central Government bodies to ensure all their buildings with mechanical ventilation use regularly maintained, low energy, air filters that comply fully with British and European standard EN 13779. IAQ should be addressed by Directors of Public Health and the new Health and Wellbeing Boards. There is a tremendous opportunity to improve public health and save energy and money through the use of regularly maintained air filters that comply fully with EN 13779. Mechanical ventilation / air treatment systems require energy to run. A mechanically ventilated building may therefore consume more energy than a naturally ventilated building with a comparable standard of energy efficiency. However, energy costs can be minimised through optimal system design and the use of low energy filters. Energy costs should also be balanced against the improved health and comfort provided to building occupants. Note that this is CAL’s interpretation of the building names provided, and actual use of the building may differ. Local authorities have different responsibilities with regards to school buildings depending on the status of the school. At one end of the spectrum are Community Schools where local authorities can be considered to have a corporate landlord responsibility to audit, advise and support the school authorities. At the other end are Academies, Free Schools, and Voluntary Aided Schools where the authority has very limited ability to direct and advise the school authorities. Note that the City of London supports far fewer schools than other London Boroughs – one maintained primary school in the City area and three sponsored City Academies in neighbouring boroughs. The City of London does not own or manage any of the school buildings.